Several weeks ago, Cassie sent me a request to doctor up the photo below for Father’s Day. This is a picture of her husband and his father. The lighting in her photo was wrong and she didn’t care for the background. 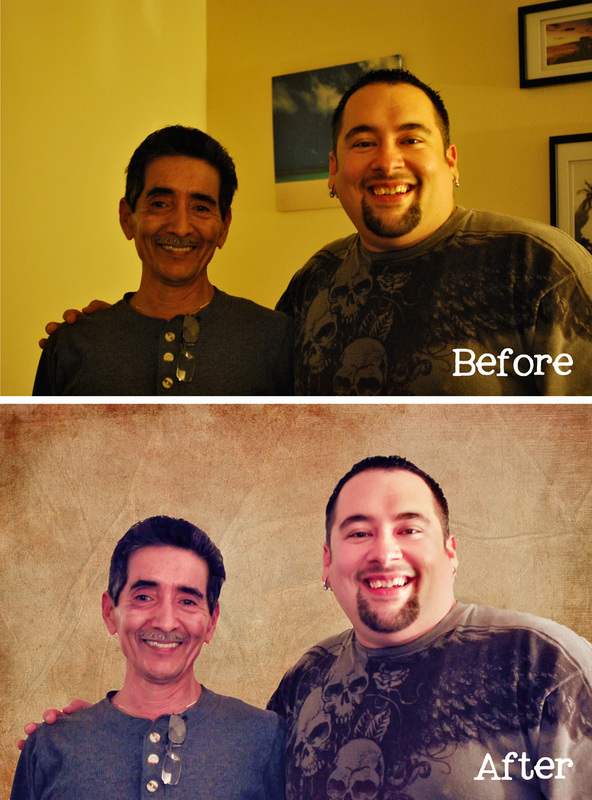 As you’ve seen in the past couple of Before & After postings, a background can easily be replaced. It’s been a few weeks since I’ve worked on this Before & After, so my steps are foggy (I even saved the PSD files and those aren’t helpful). Rather than give you the wrong information, let’s just say I removed the background, repaired the white balance, added texture and called it a day. Now, I must get back to my own father (we’re trying to install a VHS to DVD converter – which is proving to be quite the challenge). Happy Father’s Day everyone!